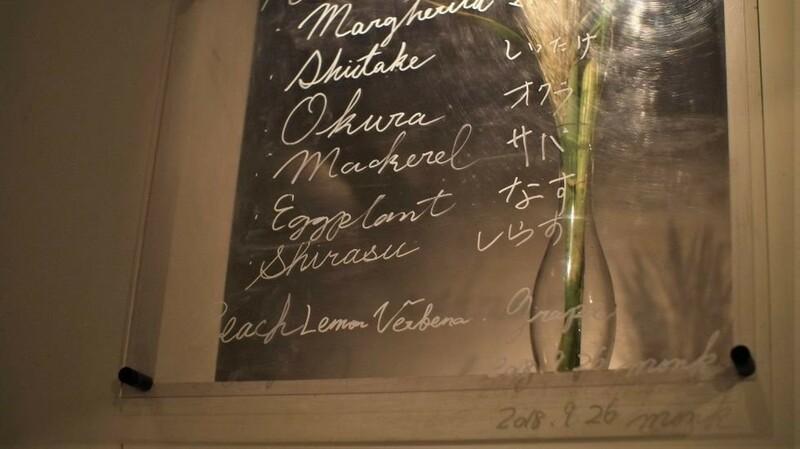 Monk is a restaurant by Chef Yoshihiro Imai, who trained at one of the best pizza restaurants in Kyoto... As we’re in Kyoto, there is something kaiseki in the dinner here, at least in the number of dishes: you’re served seven. But the most special one for most people here probably is the sixth one: pizza. A course meal centered around pizza is something pretty unique in Japan, if not the world. The best word to describe Monk would probably have to be intimate. The restaurant seats a maximum of 14 people, and only has two tables: the other seats are at the counter. You get to view as Chef Imai works the fire of his huge pizza oven right in front of your eyes: you even get to feel the heat radiating from it. The specialty of this restaurant is the vegetables it serves: they’re fresh from the Ohara area of Kyoto, an area renowned for the beauty of its nature. Most of the dishes here are quite simple, but still full of flavor, as the ingredients themselves are allowed to shine. The menu here changes daily, based on what are the best ingredients available just that day. Personally, my favorite here was daikoku shimeji (a type of big mushroom from Kyoto with a matsutake-like fragrance) served with caciocavallo cheese from Wakayama and raw chestnut shavings. The cheese brought umami to the taste and the chestnut shavings earthiness; it was a delicacy I won’t soon forget. The pizza oven is imposing; its heat makes you feel toasty, and in the dark restaurant, it also lights up the mood. So you’d not be wrong to expect great things from the pizza served by Chef Imai: they are maybe the best in Kyoto, if not the whole Kansai area. They’re cooked to perfection, but it’s the ingredients that make the pizza here stand above the rest: there is something in the freshness of them that makes the taste that much stronger. The dough is left to rest for at least 48 hours; another reason for the depth of the taste. You get one pizza per two people, but you get to choose two ingredients to make your pizza a half-and-half. This is the signature stout of Monk: a Belgian beer that happens to bear the name Monk, just like the restaurant. The taste is rather mild for a stout, and I kind of regret starting my dinner with this beer as I feel like it would have complimented the pizza more. The best course of action would probably have been to order a second bottle. At Monk, they have three starting times for dinner: 5:30 pm, 7:00 pm, and 8:30 pm. You need to be on time, as the service starts for everyone at this time. They also have non-alcoholic wine. I have been to Monk twice already, and while both times were wonderful, it was surprising just how much the menu changed between my visits. The food is not “seasonal” here; it changes daily, based on what the best ingredients on just that day are. For me, the most remarkable thing here has to be the pizza. Just thinking of it is enough to make my mouth water. There are many plants, herbs, and vegetables on display at the restaurant, and it has a simple but very charming atmosphere. The meal I had was special and almost everything was made by using the pizza oven, like the pizzas (of course) and the chef even used charcoal from the oven to grill the fish a bit. This time we sat by the counter, and it was really fun as we got to see how the chef used the pizza oven to cook the food and we also got to talk with him. This restaurant also has tables, but my recommendation is the counter! The restaurant is located by the Philosopher’s Path, a 15-minute walk from Eikando Temple. You can also get to Monk by taking Kyoto City Bus #32, #203, #204, #17 (among others). Mondays and the first Sunday of the month. You need to have a reservation if you want to dine at Monk.